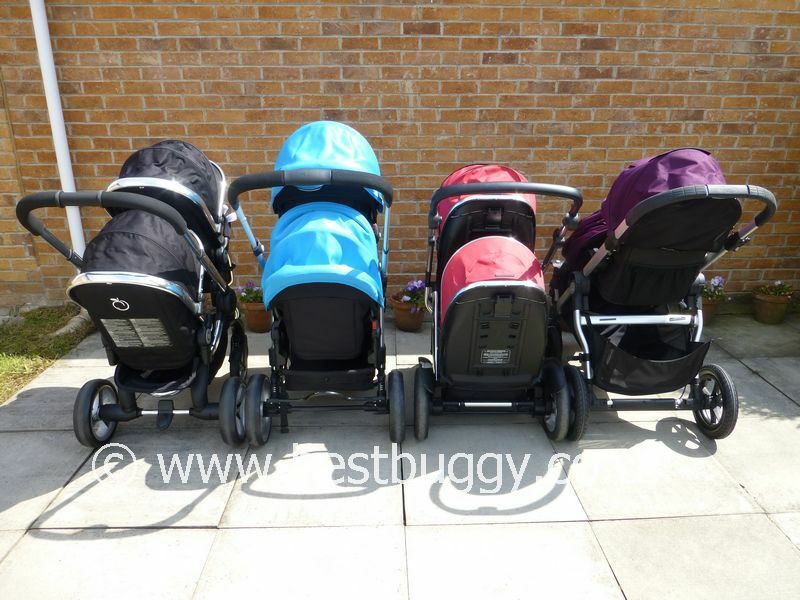 This photoset shows four of the best single to tandem pushchairs we have tried here at BBHQ. These pushchairs can be bought as a single pushchair for baby No 1, and then have a second seat (or carrycot or car seat) added for a new arrival. We have used all of these as single and tandem pushchairs with our children. 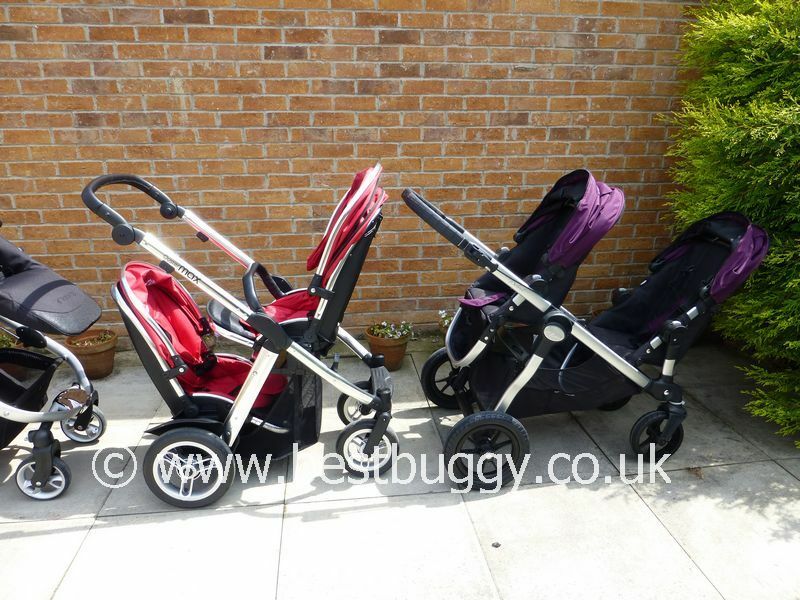 From left to right they are: The iCandy Peach Blossom 2 (black), the iCandy Apple 2 Pear (blue hood), the Babystyle Oyster Max (red) and the Baby Jogger City Select (purple). These photos are purely to give an idea of relative size. 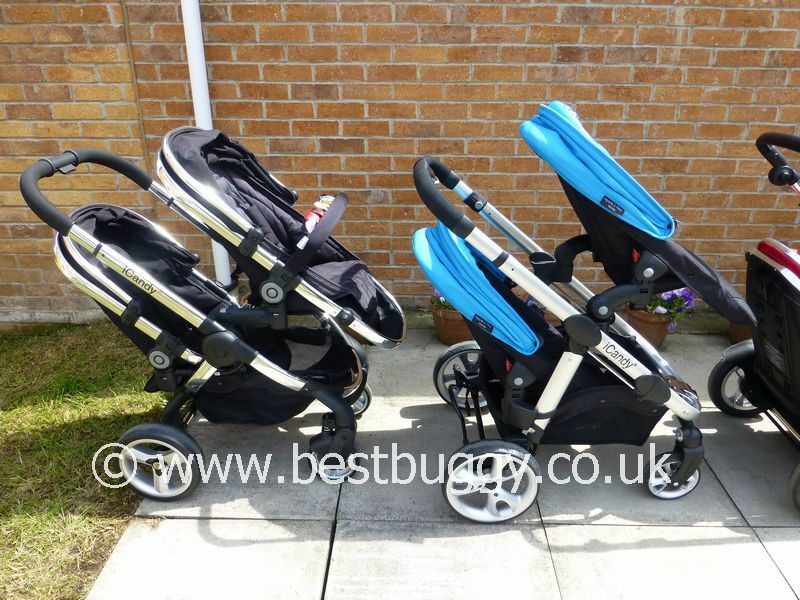 The tandem pushchairs are lined up along the back by the rear axles to give a good indicator of length. Please bear in mind that in most (not all) of these photos, the handlebars are set to the maximum height thus e.g. on a bus, the handle could be pushed in to make the pushchair footprint smaller. The boy in the photos is 2 years 10 months old and is 87.5cms tall (9th centile for height). He is shown in both the upper and lower seats. These seats have been set up to the maximum settings except for the City Select, where the seats are identical, thus we set one seat to the maximum, and one to the minimum size. The two Apple 2 Pear seats are also identical in size. The Oyster Max and Peach Blossom 2 seats are slightly different, but not by a lot. 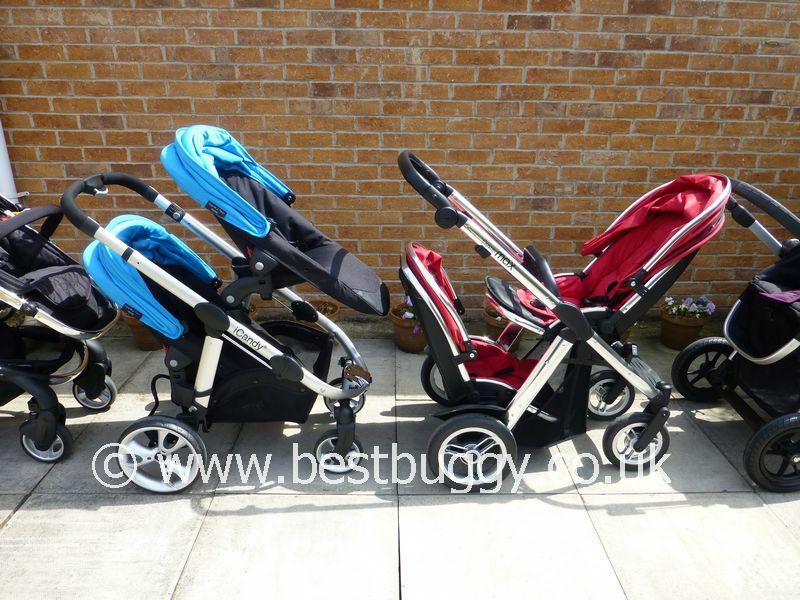 There is very detailed information on all of these pushchairs here on Best Buggy. These photos are not representative of everything these pushchairs can do, but are designed to highlight the main features / seating positions / upright and flat recline positions / fully open and closed hood positions etc. 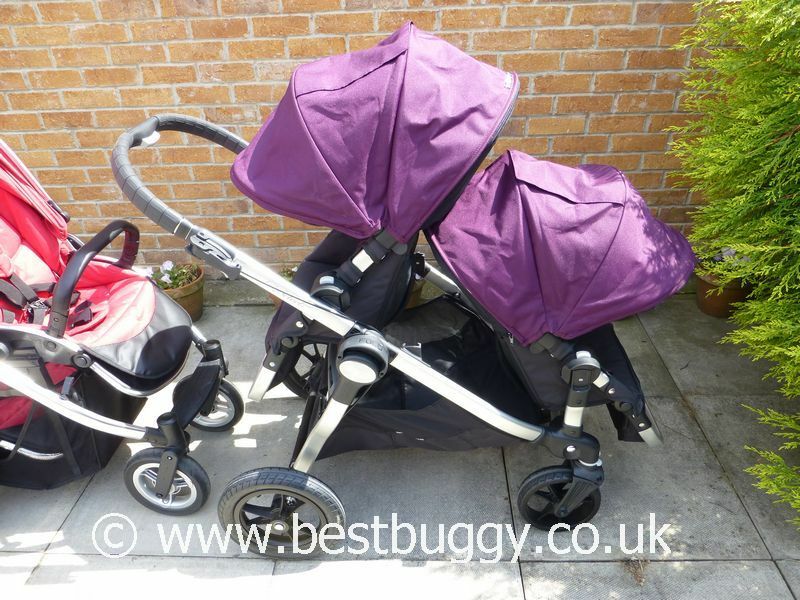 The main things to note are that the two iCandy pushchairs can only have forward facing seats (although both have a parent facing car seat option). The Babystyle Oyster Max and the Baby Jogger City Select both have a parent facing option – the Oyster Max can have both seats facing each other, or both seats forward facing. The Baby Jogger City Select has a choice of 4 seating positions – both forward or both reverse facing, facing each other or back to back. However City Select only has a good recline when the seats are both parent facing, or the seats are facing each other. The Baby Jogger City Select has a huge, very accessible basket in tandem mode. The Peach Blossom 2 has a big basket although access is from the front and underneath the seat unit. The Oyster Max basket on the production models is larger than our basket, with easy access from the front. The iCandy Apple 2 Pear has no real basket space in tandem mode. In single mode, all these tandems have good sized baskets. Due to time and fading light, we were unable to show all the fold positions of these pushchairs. We suggest that reading our individual reviews and looking at the photosets for each pushchair will yield more information. For example both the iCandy Apple 2 Pear and the Baby Jogger City Select can be folded with both seats in situ. The Oyster Max can be folded with one seat on, and the seats also fold up like clamshells for neat storage. The iCandy Peach Blossom 2 needs breaking down into its component parts, but the chassis sized folded is very small, and having separate pieces can make storage easier in a small car boot or MPV. 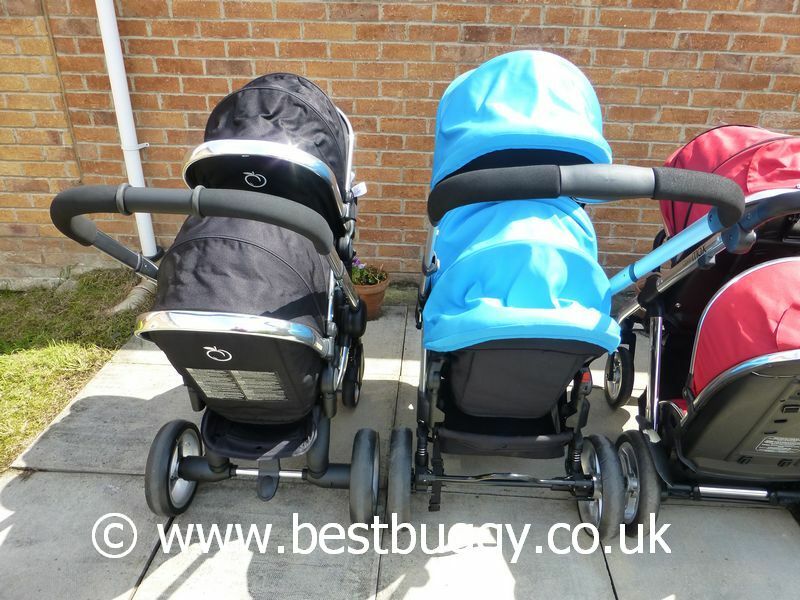 This set of photos show the various adaptors that each pushchair needs to turn from a single pushchair into a double pushchair. However the adaptors for the Oyster Max can be permanently left in situ. The 4 parts which make up the lower pip convertors for the Apple 2 Pear can also be left in situ. The upper Apple 2 Pear pip convertors and the City Select lower seat adaptors could be left in situ, however we suggest there is more chance of them being damaged if left in. The Peach Blossom needs the pip convertor bars removing before folding. In order of ‘light to push’ bearing in mind, we have road tested all of these pushchairs at length; there is no doubt that the lightest to push is the iCandy Apple2Pear, followed by the Babystyle Oyster Max, then the Peach Blossom 2 and finally the heaviest by a considerable way behind the Peach Blossom 2, is the Baby Jogger City Select. I can not stress enough that the first three, are fairly close together for pushability. 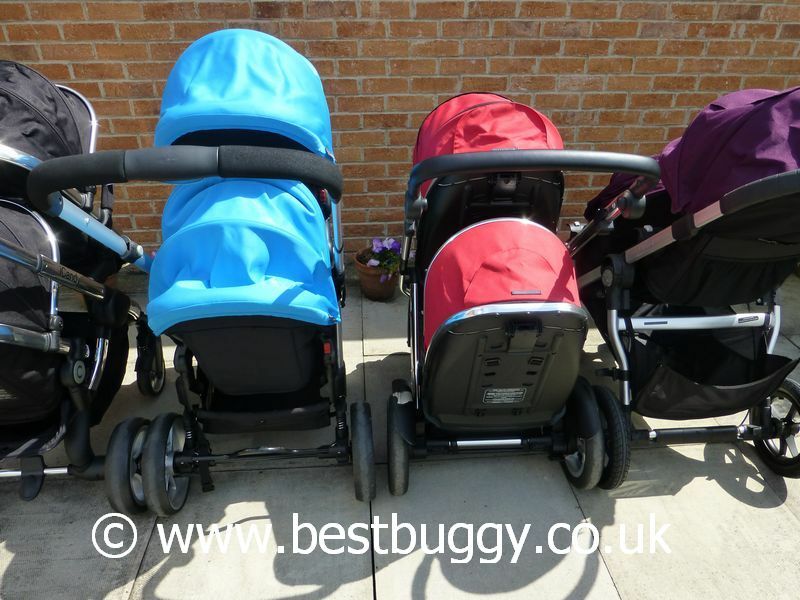 All these pushchairs have the choice of one or two carrycots or car seats being added, or various combinations of seat units, car seats and carrycots. These are all suitable for siblings and twins, although some are better suited to twins or to different aged siblings than others. All of these pushchairs are excellent. However we think it is important to choose which one would be post appropriate for your family based on your age gap and lifestyle. They all have strengths and weaknesses. Again our reviews should highlight what these are. With many thanks to iCandy, Babystyle, Nurseryland in Wakefield and to Sarah Naylor, for helping us set up this photoshoot.